Thought Tony Abbott as Opposition Leader was the nuttiest piece of right-wing nonsense you’d see this week? Think again . . .
← Is climate change denialism the new Hansonism? No kind of leading questions in there…I’d love some advice on survey design from Fred! Surely…surely that must be fake. 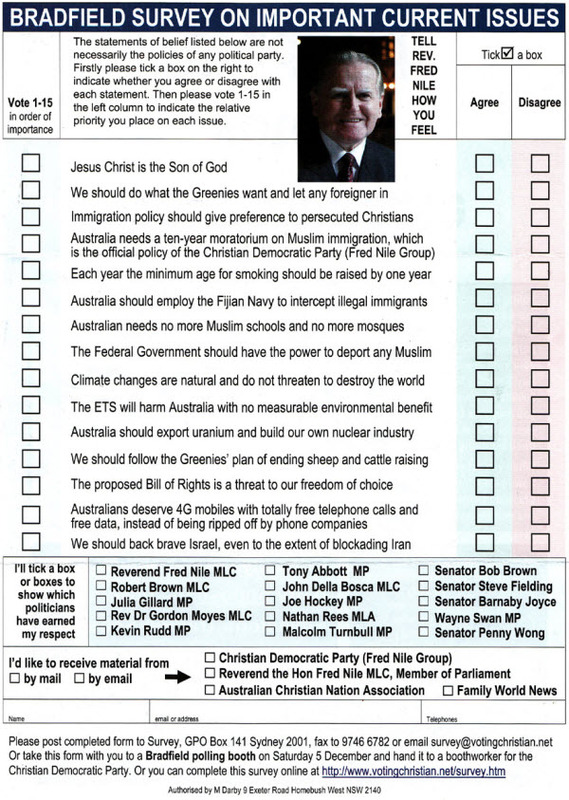 I mean, I don’t have any respect for fred nile already, and – I mean, what’s less than no respect? Can you even have negative respect? Crazy nutter is crazy etc. “Tell Rev Fred Nile How You Feel”. This sentence is skin-crawlingly cringeworthy and the rest is (almost) funny. Okay, here’s what I know. I’m not going the full Windschuttle and claiming I’m 100% on its bona fides, but I received it from a legitimate source who says it’s for real. And in support of that argument I’d point to the fact that the web link works, so you can do the survey online, that the person purportedly authorising it is real, and that a google search reveals it’s been up at The Tally Room for a week without anyone suggesting it isn’t authentic. And, as I pointed out on Hoyden About Town an hour ago, it IS Fred Nile we’re talking about. But all that said, I’ve not done a rigorous fact check, and I’m perfectly happy to admit it’s bogus if someone has evidence it’s a stitch-up. Fair enough? I don’t even want to chase this up on the net to investigate, because I’d hate to even raise their website click stats even a miniscule nano-particle…it doesn’t surprise me….but it does alarm me to think of what would happen if you really did fill out the form with your name and ADDRESS and phone number…you might get a visit from some “friendly” folks a few days later. now I’m trying to remember, in Central Queensland a few years ago I remember unwittingly buying a copy of a newspaper in a petrol station…a sort of conspiracy theory right wing rural survivalist evangelical thing…can’t remember the name of it…. I, too, thought it was a hilariously clever joke when i first came across this; and to my horror it slowly dawned on me that it may not be. I checked it out and found much of what James has cited, but here’s the thing that really convinced me of its authenticity: ANTONY GREEN THINKS IT’S TRUE. Enough said. If Antony says it’s true that’s good enough for me. The thing that annoys me most about this survey is that you have to rank the statements in order of preference. What if I want to back brave Israel as much as I want a free 4G phone?